Rod Hall is one of the founding fathers of off-road racing in Baja, Mexico. Over 40 years ago he made his first peninsula run before GPS, cell towers or decent safety equipment. And the mensch isn’t slowing down: next week he’s doing his 50th 1,000 mile Baja race in a truck he pulled out of a museum. The 2016 NORRA Mexican 1000, a 1,000 mile off-road rally from the top of the Baja peninsila to the bottom, kicks off this weekend in Ensenada. The finish line and afterparty are in Cabo San Lucas next Wednesday, April 27th. In between is a lot of sand, scares, probable breakdowns and cacti. And tequila. NORRA encourages lower-budget, arguably friendlier competition with a big party atmosphere just about the whole way down. The result is a race that’s really more like a conga line down the coast. And if you’ve been reading my writing for awhile, you’ve probably seen that phrase before. 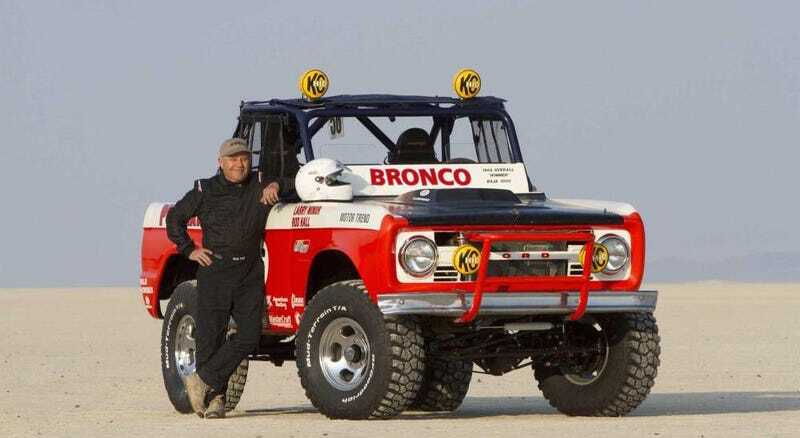 Anyway the Bronco that Hall is running this year is the very same Bill Stroppe-prep’ed rig he won the 1969 Mexican 1000 in with teammate Larry Minor. The truck had an interesting life after that; eventually ended up in a Barstow junkyard, as a prop in front of a Denny’s, and was finally given to the Off-Road Hall Of Fame in 2003 when somebody realized what they were looking at. The NORRA Mexican 1000 is as “Jalopnik” as a motorsport event gets. It’s about personality over power. If you want to know more, check out the short film we shot at last year’s event. This year, I’ll be heading back down to Baja with the same crew I joined for the SCORE Baja 1000 in November, to help live broadcast the entire race. It’s. Gonna. Be. Sandy. Also excellent. Stay tuned!